Colca Canyon is the canyon of the Colca River in southern Peru. It is located about 100 miles (160 kilometers) northwest of Arequipa. Colca Canyon is one of the deepest canyons in the world at 10,725 ft (3,269 m), it is more than twice as deep as the Grand Canyon in the United States. However, the canyon's walls are not as vertical as the ones of the Grand Canyon. The Cotahuasi Canyon nearby to the northwest is wrongly referred to as being a deeper canyon at 11,488 ft (3,501 m); but it does not truly satisfy specifications to be a canyon. Since they are such major features of the landscape, the Colca and Cotahuasi canyons are both easily recognizable in even low-resolution satellite photos of the region. The Colca Valley is a colorful andean valley with towns founded in Spanish Colonial times and formerly inhabited by the Collaguas and the Cabanas. The local people still maintain ancestral traditions and continue to cultivate the pre-Inca stepped terraces. The Colca River starts high in the Andes at Condorama Crucero Alto and changes its name to Majes, and then to Camana before reaching the Pacific Ocean. Parts of the canyon are habitable, and Inca and pre-Inca terraces are still cultivated along the less precipitous canyon walls. The small town of Chivay is on the upper Colca River, where the canyon is not so deep but where many terraces are present in the canyon and continue for many kilometers downstream. 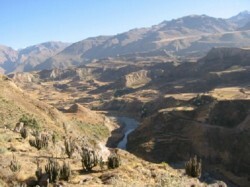 As the canyon deepens downriver, a series of small villages is spread out over the approximately 35 miles (56 km) between Chivay and the village of Cabanaconde. The canyon reaches its greatest depth and, in contrast, about 15 miles (24 km) to the southeast rises the 20,630-ft (6,288-m) Nevado Ampato, a snow-capped extinct volcano. Attracting more and more visitors each year to the Colca Canyon, in addition to the awesome sights, are the Andean condors. The Colca Canyon is home of the majestic Condor. Tourists can see the big condors at fairly close range as they fly through the canyon. The canyon is the natural habitat of the great Andean condor (Vultur gryphus), a species that has seen world-wide effort to preserve it. 'Cruz del Condor' is a popular tourist stop to view the condors, the pass where condors soar gracefully on the rising thermals occurring as the air warms. The condors hunt in the early morning and late afternoon, so it is best to be there during those times. At this point the canyon floor is 3,960 ft (1,200 m) below the rim of the canyon. The Colca Canyon is also ideal for Adventure Sports. In addition, the La Calera natural hot springs is a wonderful way to relax after a day's touring. The hot springs are located at Chivay, the biggest town in the Colca Canyon. This is our selection of Arequipa city and Colca Canyon tours, the most exciting tours and adventures in Peru.